Home > VAT > What Does the VAT Rise Mean for Me? The VAT increase has been one of the most talked-about changes implemented by the coalition government. It has caused furious debate in Parliament and in public, with many people suggesting that it hits the poorest hardest. 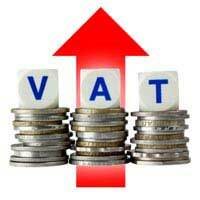 Regardless of arguments, the VAT rise has happened and it looks like it is here to stay. It is important that you understand the rise, and how it impacts on you. In his June 2010 Budget, Chancellor George Osborne announced that the headline rate of VAT would increase from 17.5% to 20%. The move caused significant political problems for the government, with opposition politicians claiming that the increase was regressive, and would affect those with the lowest incomes most significantly. The increase came into force on 4 January 2011. From this date, VAT-Registered Businesses were obliged to charge the 20% rate – although this does not necessarily mean that the price you pay has changed. In short, consumers will see a rise in prices. At a time when inflation is increasing anyway, this will be an unwelcome strain on many peoples’ bank balances. It is important to understand how the change affects prices. Many businesses claim to have ‘absorbed’ the VAT increase, or have promised not to pass it on to consumers. But what does this mean? Businesses are obliged to charge VAT at 20%. But, rather than putting up their prices, some businesses have chosen to absorb the increase. This means that their profit margin drops a bit, and you end up paying the same. It is worth noting, though, that some businesses have used the increase as an excuse to push their prices up even further than the VAT rise would otherwise demand. Therefore, you may wish to spend a bit more time shopping around in order to make sure that you are not paying over the odds. As a business owner, the VAT increase presents you with a couple of problems. To begin with, you need to think about whether you intend to absorb the increase, or pass it on to your customers. There are three main factors to consider when making a decision. To begin with, can you afford it? If you can’t afford to absorb the increase, there is nothing you can do. Second, what are your competitors doing? If they are passing the increase on, you might be able to secure extra custom by absorbing it. On the other hand, if they are absorbing it, you might lose custom by passing it on. Finally, is price a big consideration for your customers? If you compete mainly on other grounds, like quality of service, there may be little benefit for you in absorbing the increase. You should also consider your suppliers. Have they passed on the increase? If so, can you get a better deal by shopping around? The VAT increase has impacted on everyone’s life in some way. You need to consider how best to mitigate the impact on your wallet.